This tweet from YouTube caught my attention last week. Increasingly better, faster processors and connectivity are the hallmarks of the Internet age. Combined with the convergence of technology, access to knowledge and information is now truly (or at least nearly) ubiquitous. What we can do with content and how we consume it is changing every day. Who would have thought that online video would constitute half of all mobile data traffic, let alone that we would even want to watch it on our third screen? And now, according to YouTube, not only is the rate at which video is being uploaded growing, but so too is our capacity to download and watch it faster than ever before. We can now watch video almost as soon as it is uploaded. Our appetite for information has grown, but is there a point where won’t be able to consume any more, any faster? Will the day come when we say enough is enough or will our consumption keep pace with the technology? Is Old Spice the best social media campaign ever? Now that the dust has settled, I thought it was time to revisit my original assertion (I was wrong) and see what impact, if any, the campaign had and we as marketers can learn from it. LOLing at the hundred or so YouTube videos that were created, it’s easy for international audiences especially to forget that the Old Spice campaign first took shape as a very traditional TV ad. Not just any ad, the spot earned top prize at this year’s Cannes Film Lions Grand Prix and went viral. For this reason it’s a misnomer to call it a pure social media campaign. Without the mainstream awareness and equity built by traditional media, it’s doubtful that we would have cared as much as we did when Old Spice started creating personalised videos responding to Twitter celebs. Cynics were quick to point out that despite the attention, the Old Spice ads had failed to translate to sales. Turns out they were wrong as well with Procter & Gamble (Old Spice’s parent company) recently announcing a 55% increase in sales of Old Spice over the last 3 months and a 107% increase in the last month alone. The bottom line is the campaign worked and based on the massive growth over the last month, and while we can’t say for sure social media played a role in this. So if the Old Spice ads as a whole did what they were supposed to and drive sales growth, what did Weiden + Kennedy (the Portland agency behind the campaign) get right with social? Based on the overwhelmingly positive feedback towards the TV ads and the affinity the public felt towards the Old Spice guy, they identified an opportunity to move the campaign beyond traditional media and bring the character to life with social media. The idea was deliciously simple and surprisingly low-tech considering the buzz it generated. Essentially, it leveraged on a very simple concept “make a series of 30 sec spots” and used social media to make it relevant to the audience. Read Write Web wrote a terrific piece about how the videos were made. While it’s a foregone conclusion that client’s will soon be asking their agencies for copycat campaigns (Cisco already tried and failed with Cisco Guy), without spending big bucks to build brand equity and a campaign concept that resonates with customers, it’s doubtful that Old Spice’s success can be replicated. Even then, for social media marketers, the Old Spice campaign failed to leverage all the good stuff inherent in social media: conversation, community, engagement. As great and as innovative as the campaign is, it remains a brilliant traditional media idea that was very smartly repurposed and repackaged for social media. Hat-tip to Mitch Joel and Joseph Jaffe who I just found out covered this topic in the latest episode of Six Pixels of Separation. I only realised this last night while listening to the podcast and well after this post had been written. If you want to hear their thoughts, you can listen here. Or at least that was the early thinking around websites. But what history has shown us is that just because you’ve built a website doesn’t necessarily mean anyone is going to come or give a crap. Coke’s decision to abandon the tried-and-tested formula of building one-off campaign websites and driving traffic towards that with massive advertising campaigns is perhaps the best proof of that. Instead, Coke will reinvest to expand their social media presence on YouTube and Facebook to go where the people are rather than forcing them to go to it. This is a great move by Coke. Instead of having an expectation that customers will type in a URL to visit their site, they are going where their customers are already playing thus causing the least amount of interruption. It’s a sign of respect that Coke understands how their customers behave and are willing to play in there too rather than forcing customers to come to them. The web also isn’t getting any less crowded with well over a bajillion sites (at a guess), a hefty portion of which probably lie dormant. Especially since most campaign-specific sites are typically neglected and rarely updated once a campaign has run its course. Sure there are long-tail benefits of having a campaign website, but it’s far more effective to be where your customers are. 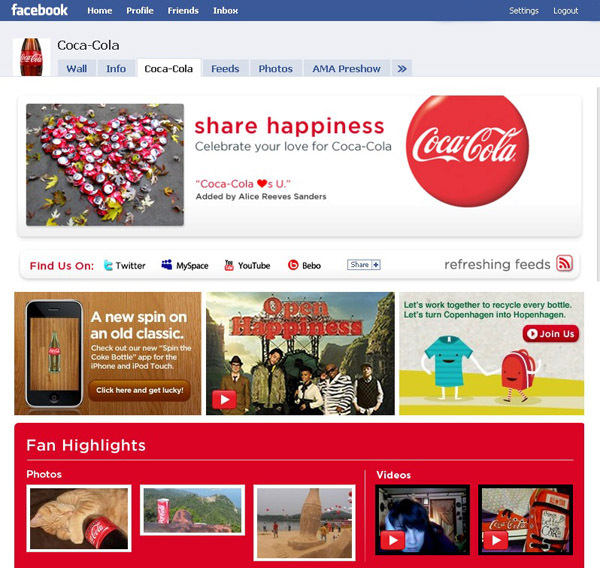 It’s clear that there is some real strategic thinking on Coke’s part about how social media can deliver against their business objectives and that social is no longer a novelty but a serious marketing tool. Also on a side note, if you want to talk about accountability (not that Coke need to watch their pennies), it seems to be a better allocation of Coke’s resources to focus on building lasting relationships on a relatively inexpensive platform rather than plow wads of dough into what will most likely amount to a temporary engagement. N.B. I’m in no way saying you should abandon your main website in favour of a Facebook fan page. Having a website that you can call your own to illustrate who you are and how you think outside the confines of someone else’s platform is a critical part of any organisation’s digital strategy.